Responding to a request from the United Nations, Samaritan’s Purse is preparing to send medical workers to the embattled city of Mosul. The city in northern Iraq has been under ISIS control since 2014 and an Iraqi Military operation to remove insurgent forces from the area started in October. When the siege began, there were a million civilians estimated to be trapped within the city. In a statement, Samaritan’s Purse said nearly 80,000 people have fled Mosul, risking attacks from ISIS insurgents. Samaritan’s Purse will be sending 40 people to deploy the emergency field hospital. 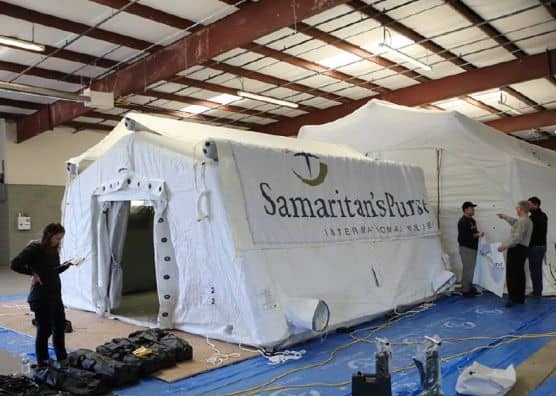 Frank King, news media relations manager with Samaritan’s Purse Canada said the charitable group is confident in their ability operate a field hospital in a war zone. Samaritan’s Purse has provided aid during many natural disasters and crisis situations including the 2010 Haiti earthquake, the 2013 Philippines typhoon and the group helped treat hundreds of people injured in a massive earthquake in Ecuador this past April. A Christian charity, Samaritan’s Purse is prepared to offer aid to people in Mosul regardless of religious or government affiliation, including members of the insurgency. King said there will be security staff and personnel on the ground in Iraq to ensure the staff is safe while treating the wounded. Because of the security risks involved with working in a war zone, the identities of the staff headed to Iraq are not being released to the public. King said Calgarians can help aid the people of Mosul by making donations to Samaritan’s Purse disaster relief efforts by visiting SamaritansPurse.ca/donate or calling 1-800-663-6500. Middle East Crisis Your gift toward our projects in the Middle East will extend a loving, helping hand to those living in the midst of strife.